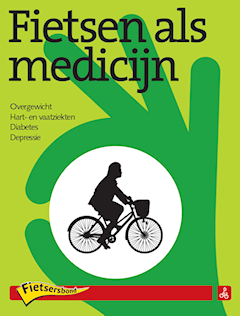 Fietsersbond, together with medical insurance company Zilveren Kruis Achmea, have a new book called "Fietsen als medicijn", or "Cycling as medicine". "The book is about the relationship between the bicycle and health. Obesity, hart and cardio-vascular illness, diabetes and depression are at the top of the list of preventable problems. They cause much personal harm and result in high costs in health care. But there is one "all on one" house, garden and kitchen medicine: The bike. In the book, normal people tell how cycling makes them healthier and experts put the medical value of the bicycle in plain language, both for prevention and cure." They go on with a few examples. e.g. Housewife Monique Ilbrink (120 kg / 260 lbs ) takes her children to school in a bakfiets. 'If I didn't cycle, I'd get fatter'"
Former gardener Peter van de Ven cycled after his two heart attacks to become fit again. He is addicted to cycling and now seldom uses a car. Marco Meijerink tells how he can keep his insulin level better under control by cycling. There are other health stories on the blog, including how cycling saves employers money due to lower sickness costs. Update January 2010: This book has now been placed in thousands of doctors' waiting rooms in the Netherlands. We've got three different bike trailers, and they're used in different ways. All three of them have been used in the last few days and I think all three are worth a few words. Our oldest is the BOB Yak trailer. In the early 1990s when we lived in Cambridge I read on the HPV (Human Powered Vehicle) mailing list about the newly introduced BOB Yak single wheel trailer. Much to my surprise, a few weeks later when I visited my parents in Somerset, their local bike shop happened to have a BOB Yak before any had been officially imported to the UK. It had been left behind by an American cycle tourist who passed through the area and sold his equipment before returning home. That's how I came to have one of the very first BOB trailers in the UK. Thirteen years later we still have that trailer and it's still used regularly. It has its limitations. You can only transport relatively light loads, up to thirty kg or so. Load it up too heavy and you will have a hard time keeping the bike upright. Put too much weight on before heading down a steep hill and you discover there is a speed at which it starts steering you rather than the other way around. Because it's a single wheel trailer it's not the best choice for shopping because it doesn't support itself, and of course if you want to carry children or pets, you need to look elsewhere. However used for what it excels at, fair distances and speeds, and it's wonderful. A single wheel trailer never tips when you corner. I find the BOB works excellently with recumbent bikes. I make a basket especially to fit the trailer, which means you can simply sling stuff in instead of having to muck about with zips. The BOB Yak and Ibex trailers are currently available with a special offer from the bike trailer shop. Theo Zweers just sent me a link to this remarkably well made video about cycling in Paris. While the video is in French, the use of graphics makes it extremely easy to understand the majority of it for speakers of any language. The title is "Angles Morts" which means "dead corners". i.e. "blind spots" in English or the "dode hoek" in Dutch. I assume this is a play on words in French as well, it indicating that cyclists are being ignored even by those who should be upholding the law. The statistics at the beginning show that like in many other places with car dominance, 47% of car journeys are under 3 km, 22% are under 1 km and 12% are under 500 metres. If conditions for cycling are nearly as frightening as they appear in this video, it's hardly surprising that this is the case. For me, viewing the video was a good reminder of how things are in the UK. The roads are full of cars, there is a need to be constantly alert for what drivers might do next and cycle facilities frequently result in inconvenience. There is no sign in the video of any regard for the subjective safety needed to make cycling a pleasant experience that everyone wants to take part in. I expect that some people reading this will be thinking along the lines of "what about the velib system?". I've written previously about the wishful thinking involved in these schemes, which actually have scope only to be used for a tiny percentage of total journeys. Let's hope that French cyclists start to see real infrastructure improvements, making journeys convenient and pleasant. It may seem to many that the incidents shown in the video are simply normal life for any cyclist anywhere. However, it would be impossible to make a video like this where we live in Assen. Such incidents as are shown simply don't occur. Seeing this video made me think about this and I've been unable to recall a single time that anything unpleasant of note has happened in the two years that we've lived here. 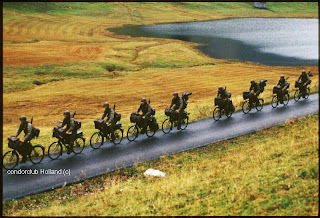 Such pleasant conditions are, of course, what makes all cycling pleasant, and mass cycling possible. Zero deaths in Paris ? There's a very popular idea going around that somehow Paris is incredibly safe and has zero deaths of cyclists. You may have wondered whether this is true or merely a myth. Perhaps unsurprisingly, given what Paris looks like in the video above, the real figures show Paris to be about as safe or unsafe as London. To make real progress in cycling safety and convenience, you need to copy the best examples. This means copying the best that the Netherlands has to offer. Dutch cities are not only far more convenient for cycling but also far safer than Paris, London or indeed anywhere else outside the Netherlands. For reasons that have always been a mystery to me, many British cyclists would seem to think France is a particularly good place to cycle. In France, just 3% of journeys are by bike. It may be three times the cycling rate of the UK, but it's still barely more than a tenth of the cycling rate of the Netherlands. There is a reason why the French don't cycle more, and you see it in this video. A new video from the fietsberaad shows a cycle park in Apeldoorn called De Serre ("the conservatory") which was designed as a transparent building so that its use was obvious from the outside as well as the inside. It is located in a shopping area near to a large department store. With space for 600 bicycles, this is not a particularly big cycle park by Dutch standards, but it is quite novel in design. The cycle park also has a social purpose of helping re-integration into the workplace. 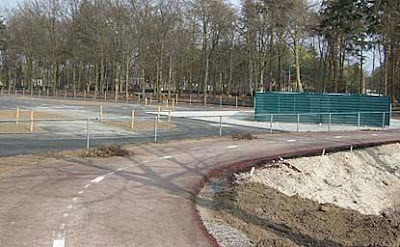 This cycle park has been popular enough that Apeldoorn is now planning a second with a similar design. The new "glass palace" will have 2000 spaces and be located next to the railway station. 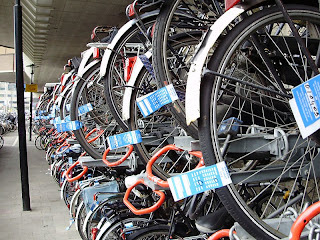 There are many more cycle parking examples. The Mango velomobile that I borrowed for a few days was great fun to ride. However, I had the small problem of keeping track of my possessions while riding. I lost my keys under the seat. This prompted me to make a basket of the peculiar shape needed to fit beside the seat so that I could drop things like the keys into it, and I rode the machine back to Groningen without losing my wallet, keys or my lunch which travelled there in the basket. The weather was absolutely terrible for the Thursday commute, so I didn't take any pictures. Regardless, it took just 53 minutes despite a mighty headwind and strong rain. Only my head was exposed and got rained on. I also made some more normal bike baskets last week, including the basket of white willow for a customer back in Cambridge where we used to live. I'd noticed last week that the rear tyre on my PDQ was badly worn again. I last wrote about this in November when I wore out the last tyre. The tyre worn , and now it's time to swap again. The tyre through to the anti puncture strip this week is the one fitted in December. Despite getting to this stage several times, I've still not ever had a puncture with a Vredestein Monte Carlo tyre, so I'm happy to stick with them. We went to the Ooievaarsringen ( "Stork Ringing" ) yesterday evening. It takes place at Droonessa, just 6 km or so from home. The first photo shows the unsuspecting mother sitting in her nest. The mother remained remarkably calm when these guys turned up and took her children. The ringing took place with a huge audience. Children were allowed to sit in front for a good view, but it was difficult to see past the crowd. I couldn't help but take photos of some of the bikes that people had ridden to see this. It had been advertised for several weeks on signs outside, and as it is on my commuting route I'd been past lots of time. There are very many more photos to view by following the "fotoboek" link from the Droonessa web page, and even a webcam. The birds are happily back in their nests now. The minor road N302 in Harderwijk will soon be overhauled completely. A bicycle transfer point is provided for motorists willing to cycle the last stretch to work during construction operations. In addition they will be provided with a free bicycle. Overall 150 people will have a transfer bicycle on loan during work on the N302. 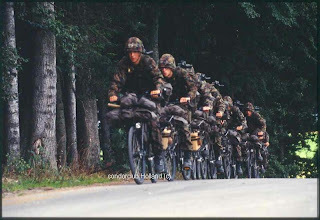 In return they are expected to cycle to work from the transfer point at least three times a week (in a five-day working week) over fourteen months. 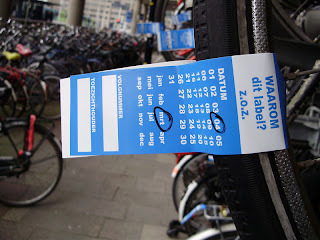 Anyone meeting these requirements is allowed to keep the bicycle (at a value of 700 Euro) afterwards. 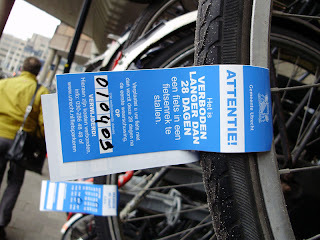 The electronic entrance to the bicycle shed registers daily who is retrieving and returning his bicycle. Participants may choose from eight different types of bicycle. Participation is completely free. The underlying reason is that supplying and maintaining a bicycle transfer point is expensive, but a shuttle bus is far more expensive. By now over 150 people have applied for the free bicycle. Cyclists do quite well over here when there are road works. We've more examples, including how road lanes are reserved for cyclists during road works.